Last week I wrote about a moment of shoe indecision -- to buy or not to buy Dansko clogs. I'd been considering it for weeks and a few days after I wrote the post, I caved in and bought some on my lunch break. Though I had tirelessly researched colors and types of leather, I was still unprepared to see them on my feet. And what I saw wasn't entirely convincing. The lunch hour was ticking away, so I just decided to get them and stare at myself a little more later. After the 8-hour workday and the walk home, my feet hurt. Hell! My knees and back hurt, too. I decided then and there that I would gamble on the Dansko's. 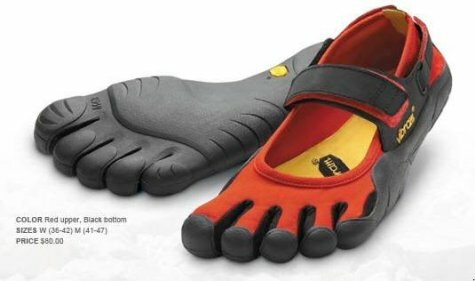 There are weirder-looking shoes out there, after all (see Vibram Five Fingers at left). So what's the verdict? I'm happy to report that after a few consecutive 9-hour days of standing and walking, my entire body feels better. Some fun technical facts: 1.) The "rocker" bottom limits impact on the heel and allows the foot to move as designed; 2.) the high arch offers lots of support; and 3.) a spacious toe box allows toes to grip and move freely as God (or whoever) intended. Now this is all extreme geekery, but answer me this. Have you ever stood for 9 hours? I wouldn't be surprised if the majority of people answered "no." Before I stumbled into the world of outdoor retail, my legs would ache after standing for a 3-hour concert. Now, I'd consider that child's play. Hate on the Dansko's, or not, I'll be sporting my Dansko's on most of my future shifts. Vanity vs. Comfort? Comfort for the win!